Disclaimer: An effort has been made to provide relevant third-party information within this photo blog. The webmaster of this blog does not take credit or responsibility for that information. Photographs are protected by copyright. Reproduction in whole or part in any form or medium without specific written permission is prohibited. Thank you, and enjoy. Click on an image to see the full-size photograph. A view looking east from Harrison Street, the cross street is The Embarcadero. 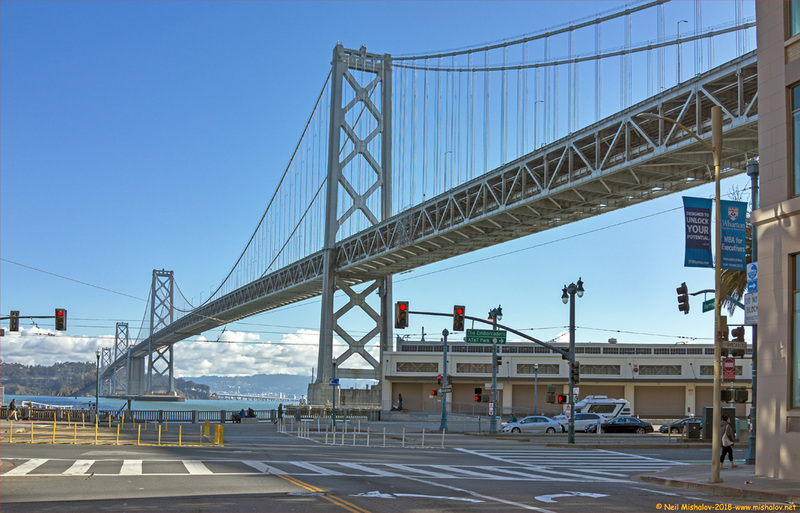 This is the western span of the San Francisco-Oakland Bay Bridge. Looking eastward at San Francisco Bay. The Berkeley Hills are in the distance, and Yerba Buena Island is ahead. This view is from Broadway, looking west. 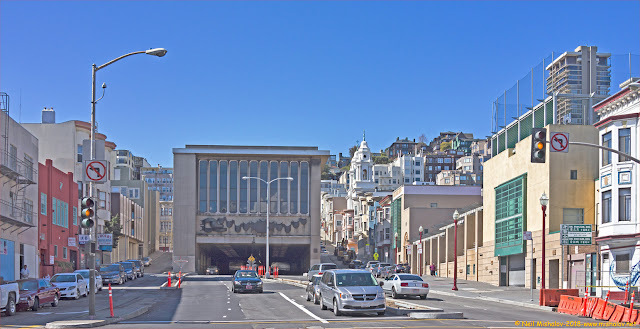 Ahead is the east portal of the Broadway Tunnel. Are you interested in seeing a photo of the west portal of the Broadway Tunnel? If so, go here to view the 21 January 2018 edition of this photoblog; it is the eleventh photo on the blog. A view from The Embarcadero looking northwest. 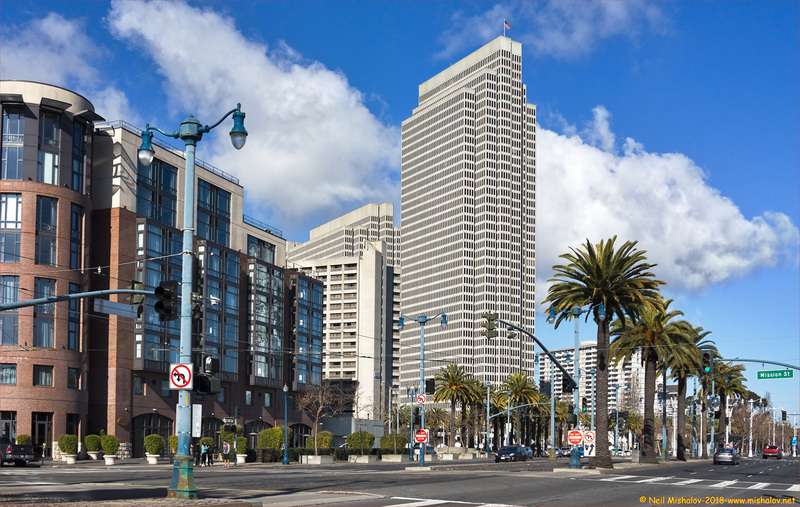 The forty-five story skyscraper is known as Four Embarcadero Center. 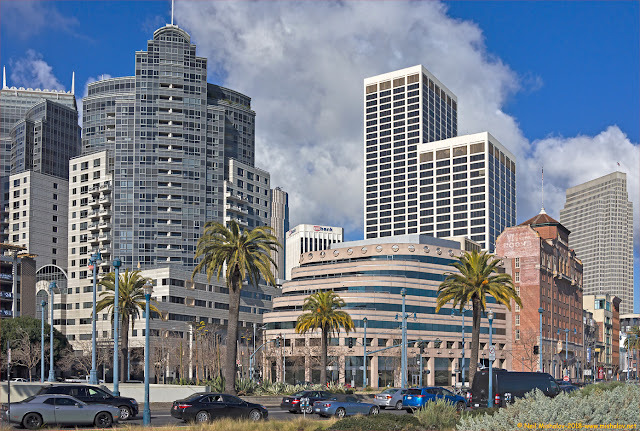 It is a part of the Embarcadero Center a six-building complex built in the Financial District. Construction of the complex began in 1971, and the work was completed in 1989. 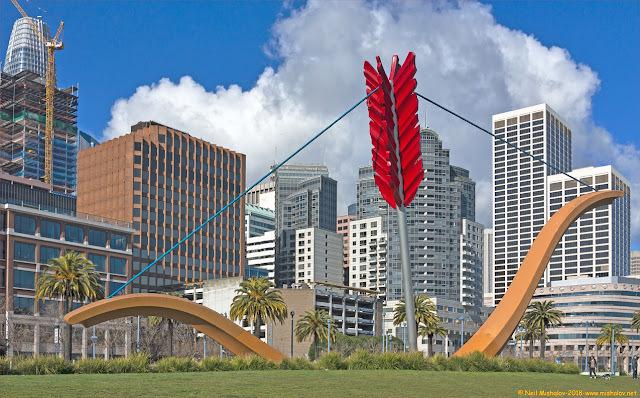 This sculpture is known as Cupid's Span; it was constructed by Claes Oldenburg and Coosje van Bruggen. The work was installed in Rincon Park in 2002, which is adjacent to The Embarcadero. The view is looking west. This is Melbourne, Australia streetcar # 496; it is traveling to Fisherman's Wharf via the SF Muni E-Embarcadero streetcar route. Streetcar # 496 was constructed in Australia in 1928. I boarded this streetcar on 27 August 2017, at which time I participated in a twenty-five mile, four-hour streetcar tour of San Francisco. Go here to view that edition of this photo blog. 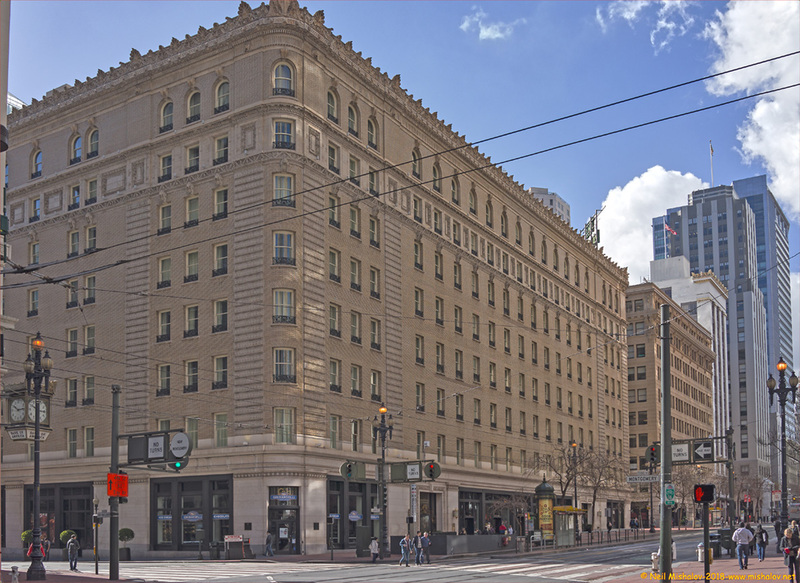 The Palace Hotel is located at the southeast corner of Market Street and New Montgomery Street. This is the second iteration of the hotel. The first building was destroyed during the earthquake and fire of 18 April 1906. This building began to accept guests on 19 December 1909. This is a view looking west up Sacramento Street. 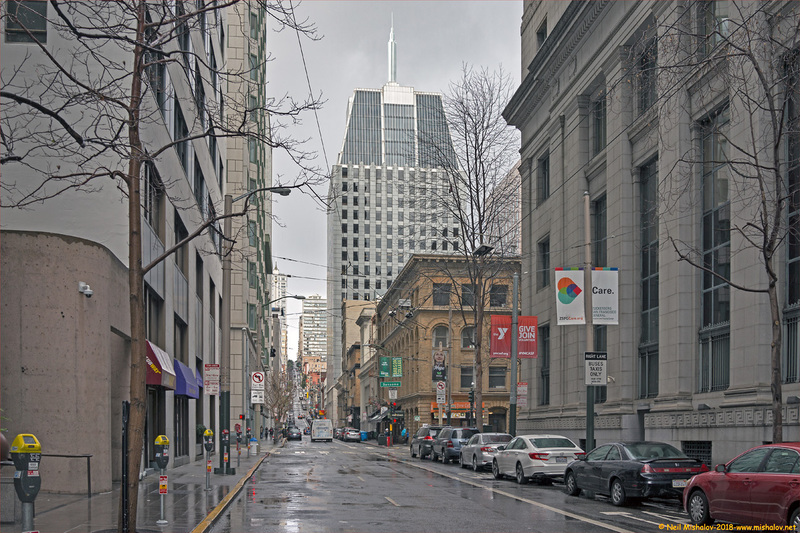 The tall office building ahead is located at 505 Montgomery Street. This building is known as the Old San Francisco Mint. 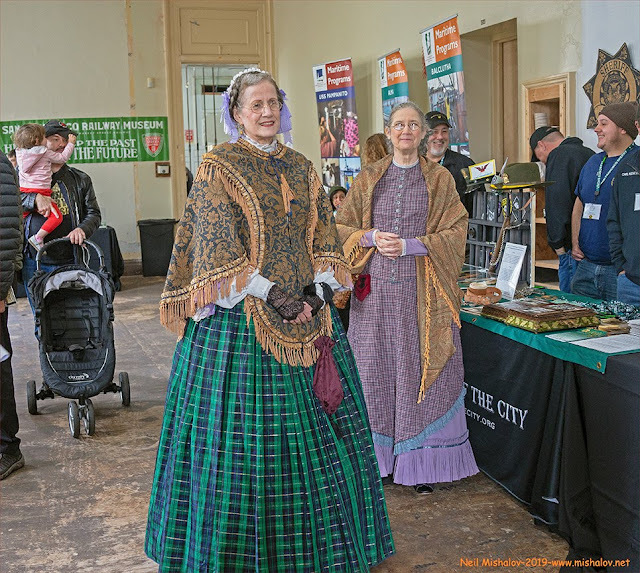 It became operational in 1874 and continued to operate until 1937 when a new mint located at 155 Hermann Street became functional. 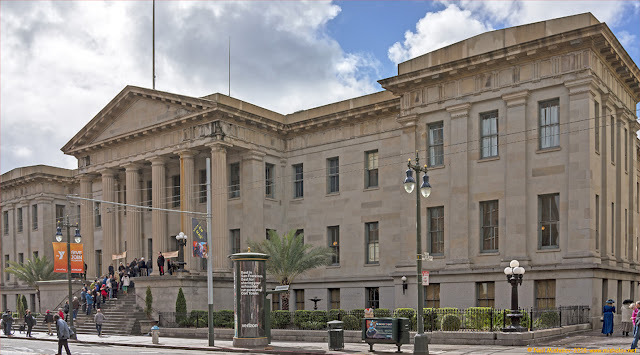 During the weekend of 3 and 4 March 2018, the Old Mint became a pop-up museum of San Francisco history. 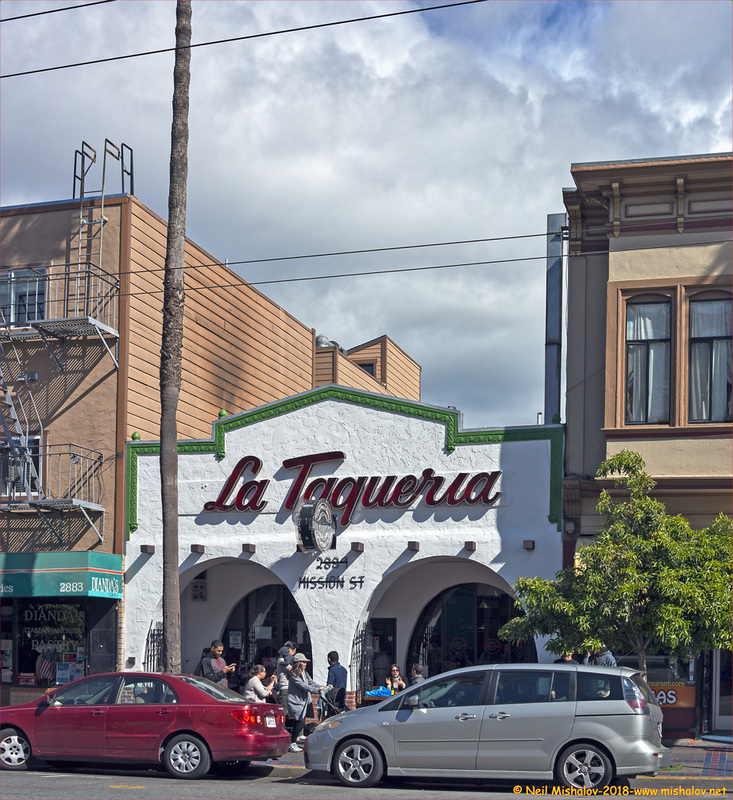 La Taqueria Restaurant is located on Mission Street near Twenty-fifth Street. 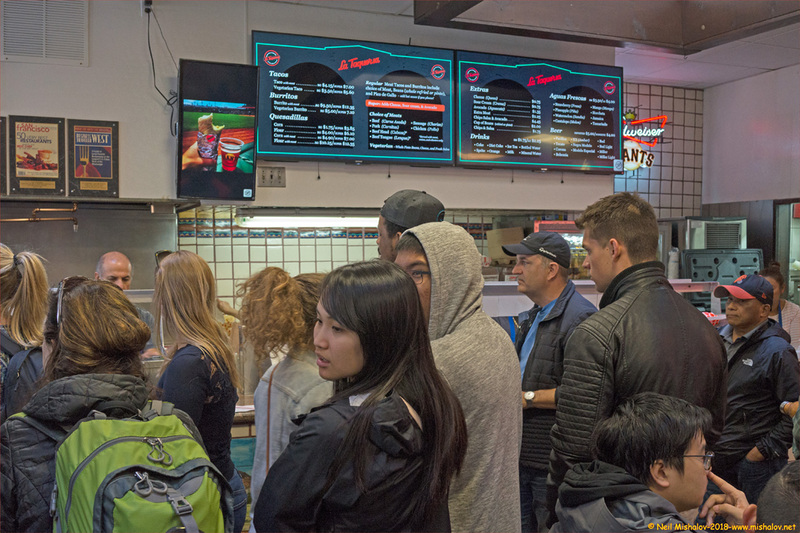 The restaurant always seems to be crowded; many people like the food and the vibrant activity. 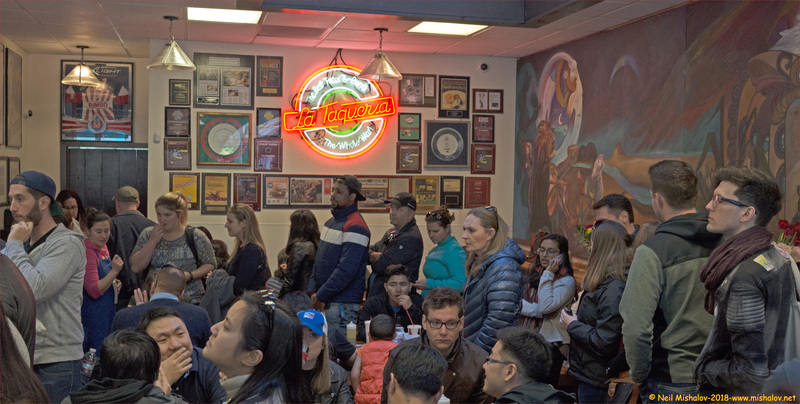 Below are three pictures I took inside the restaurant as I waited in line to order a quesadilla. 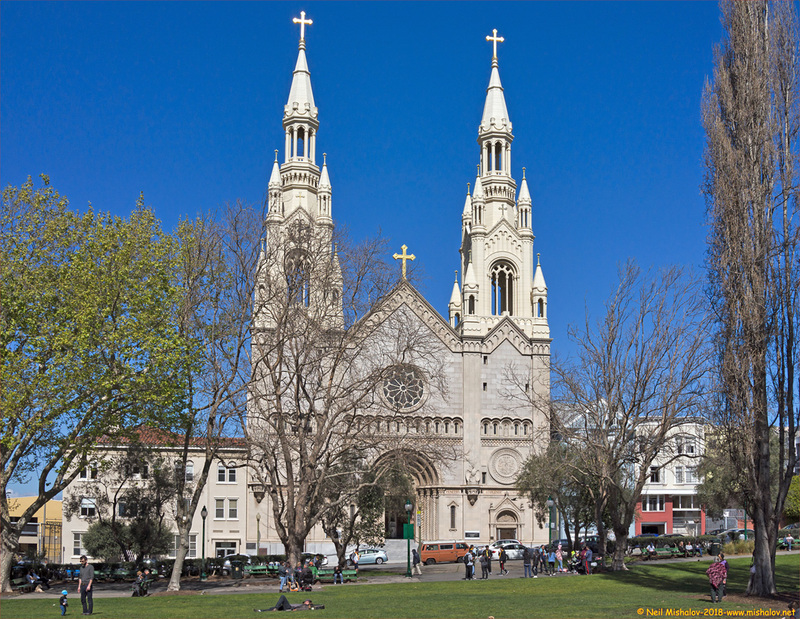 This is Saints Peter and Paul Church, it is located on Filbert Street in the North Beach neighborhood. Joe DiMaggio married Dorothy Arnold in this church in 1939. They were subsequently divorced in 1944. Then in 1954, Joe DiMaggio married Marilyn Monroe; that marriage took place in San Francisco's City Hall. Joe DiMaggio died at the age of 84 in Hollywood, Florida on 8 March 1999. His funeral took place in Saints Peter and Paul Church on 11 March 1999. Construction of the Trans-Bay Tower is almost complete. It is 920 feet in height (326 meters) and has sixty-one floors. 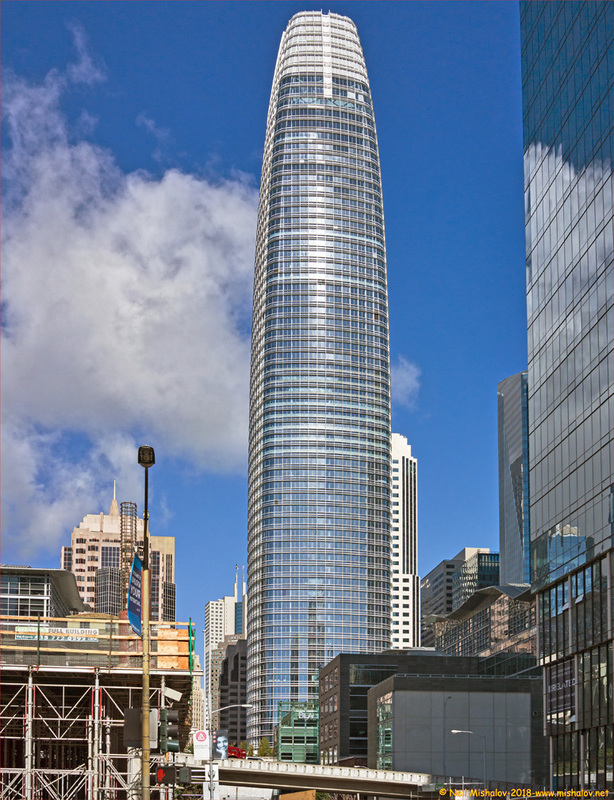 It is the tallest building in San Francisco and it is located at 415 Mission Street. On John Street, looking east. The cross street is Powell Street. 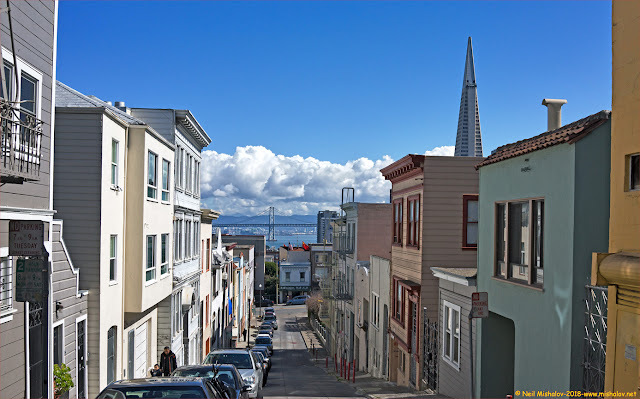 The upper portion of the Transamerica Pyramid is visible on the right. The brick building on the right side of this photo is the old YMCA Hotel, which was built in 1928. If you look closely at the brick building, you can see near the roofline some faded white paint stating 'YMCA ROOMS'. In June of 1960, I took a Greyhound bus across the country to visit California and San Francisco. I spent three days in San Francisco, and during that time I had a room in the YMCA Hotel. The hotel is located on The Embarcadero. The first volume of the San Francisco Bay Area Photo Blog contains galleries of photographs that were posted on the Internet between 2002 and 2011. Click Here to view those photos. A Sony camera was used to take these photographs. 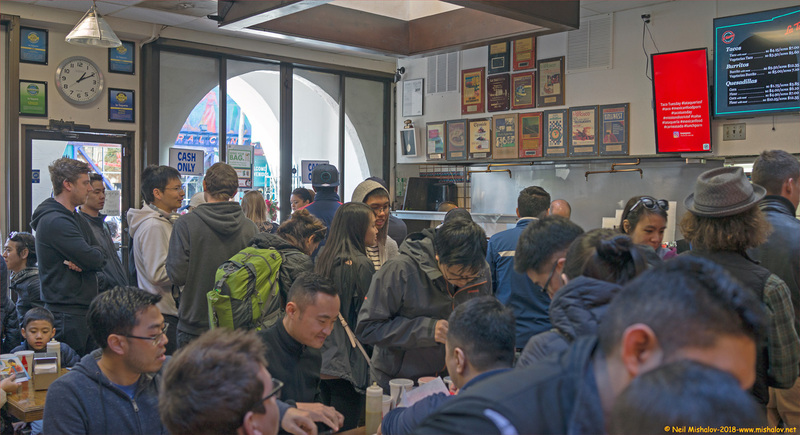 The ten most popular posts, updated daily. The photographs are protected by copyright. Simple theme. Powered by Blogger.